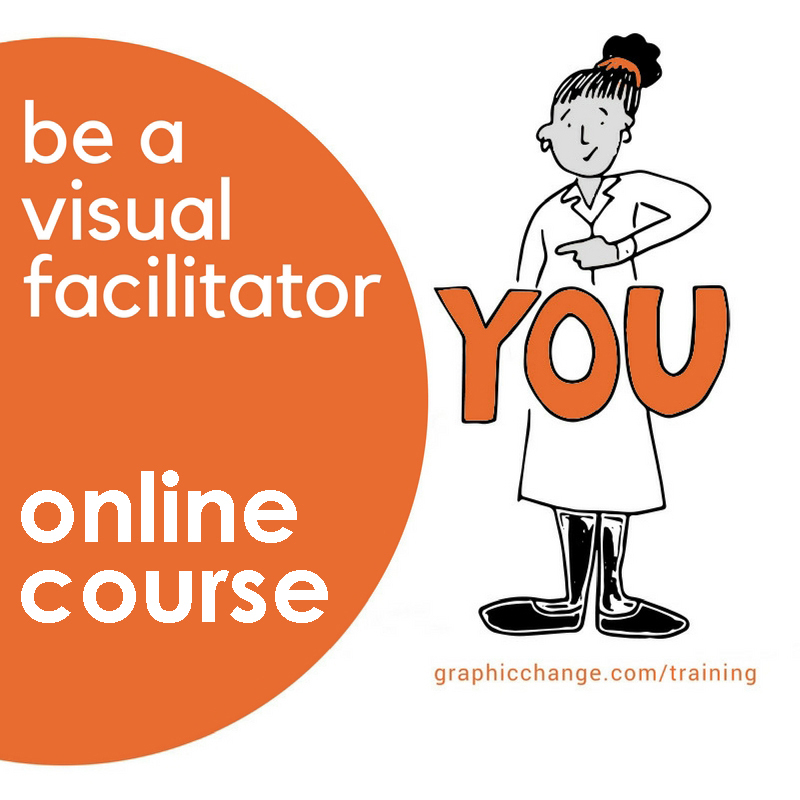 Want to be a graphic facilitator? If you are a trainer, coach or facilitator I bet you’ll recognise the deep satisfaction of knowing you have changed someone’s view on the world even if it’s only in a small way. You’ve given them a skill they will have forever. Shared knowledge with them that they will always have. I mean really it’s frickin amazing! I love training people. It’s something I’m passionate about. Of course I typically train people to work more visually but what you might not know is that I deliver my training sessions using visual tools. I’m a Graphic Facilitator. 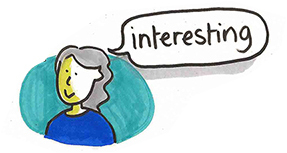 Huh…what is a graphic facilitator? As trainers, coaches and facilitators you’re already an expert at what you do. Whether you’re training in one topic or across a range of programmes you already have a deep knowledge of your area of work and you probably already use some visuals. Pictures in your powerpoint? A smiley face on your feedback form? You do that already because it makes a difference. It makes things friendlier, more approachable and more accessible. Being a graphic facilitator is all that x1000. A graphic facilitator uses simple images and visual tools to help sessions be both more enjoyable and more effective. It’s win-win. People understand more of what you’re saying and can remember it for longer (honestly there’s a heap of science behind it). Add to that the fact that they enjoy it more too and you’ve seriously taken your sessions to the next level. I know. Don’t worry. You’re not alone. It’s a very common lament, and don’t get me started on the education system that’s left a generation of perfectly capable adults convinced of this fact…anyway...suffice to say it doesn’t matter. There is some drawing involved but it’s functional not artistic. So think stick figures rather than Botticelli. All the drawing skills you need can be taught. Yes. Even to you my friend. Everything from visual agendas, to flipchart hacks to visual scales and reviews, there are a tonne of tools and methods that can fit in to what you are already delivering. Think of it as the cherry on top. No scrap that, think of it as the icing, the cherry and fizz you’re having with it. It can turn a session from a great cake into afternoon tea at the Ritz. “I really enjoyed this course - very clear and has already inspired me to work more visually” K. Mistry. Graphic Change is a visual thinking studio that works with individuals and businesses helping them to get the benefits of working visually. If you want to find out more about working visually in meetings join our online course Be a Graphic Facilitator to learn the skills you need, or if you want to chat through a possible project, get in touch. If you enjoyed this read, let us know by clicking 'like' below, and if you know someone who will appreciate this post, share the love. 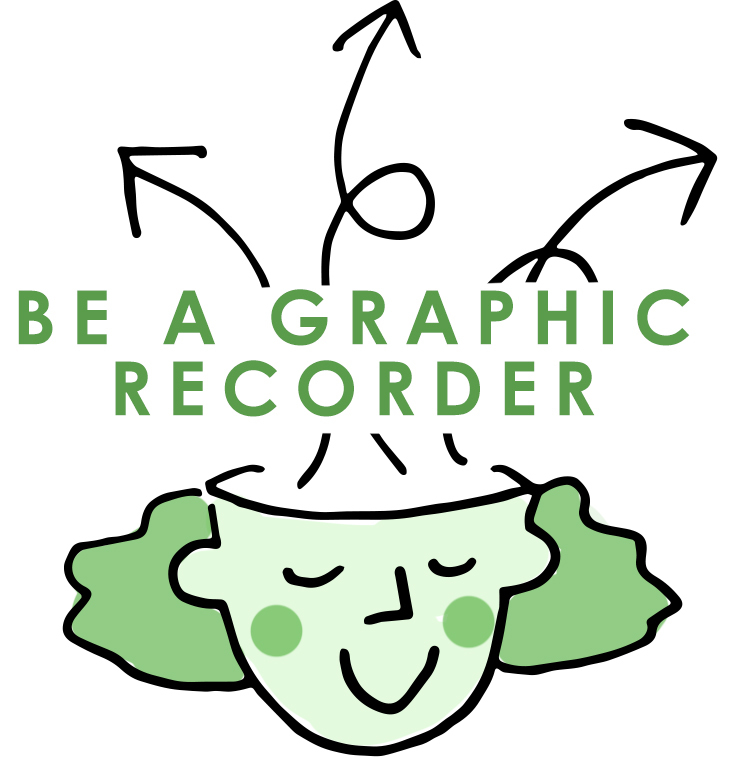 Want to be a graphic recorder? There can be few things more satisfying (in a work sense) than doing a job that makes you happy, makes other people happy and has a tangible, real time benefit to the context you're working in. I get to draw in some amazing places around the world, (...underneath Concorde, in the ballroom at the Savoy, on the roof of the National Theatre, by an Italian lake, in a morgue...), I get to meet fascinating people and sit in super interesting meetings (mostly they're confidential so sshhhhh!). Life as a graphic recorder is full of 'feel good', in fact it's such a nice job that I often get a round of applause as people wrap up their session, but it's still a relatively unknown career for most people. I think it's time that changed. If like me your dream is to earn a good living out of working creatively then it might be worth a closer look. Everyone's different of course, but here are 5 traits that lend themselves to life as a professional graphic recorder. Now I spend a lot of time showing people how to work visually and get the benefits of visual thinking, even if they can't draw at all. This is not that. To be a professional graphic recorder (as opposed to someone using visual skills in their role) there is, rightly or wrongly, an expectation that you can draw, and that the finished graphic record will both make sense and look good. So although you don't need to be in any way an artist, you do need to be able to draw identifiable objects quickly. By that I mean you're able to take in information, which may be random, unexpected or about a topic you're not expert in, and make sense of it. If you're not sure if this is you, then go and pick a random TED talk, have a listen and see if you could understand the key points. If you can then you'll probably be fine. By this I mean that you're able to get pleasure from a job well done, even if you don't particularly enjoy the content. Sometimes you'll be called upon to draw opinions that may not be yours, or listen to content that you don't find interesting. Your role is not to join in the discussion, but to identify and capture key points, connections and themes, all of which helps the participants process and understand the information better. You are there in service of clarity. Stuff goes wrong all. the. time. Equipment fails, agendas change without warning, and all possible human and environment variables come into play at some point. You need to be able to think on your feet and go with the flow. Be a sapling not an oak tree. Most people in this field are self employed or running their own small business. The scene is evolving slightly as some corporations are hiring their own in-house graphikers, but in the main, you have to be okay with the rollercoaster that is working for yourself. So are you able to build relationships, talk about money, and have enough systems in place that you know the right image file is going to end up with the right client? You'll need to be able to deal with unpredictable cash flow (especially at the start) and still get your bills paid on time. If you had most, or maybe even all of these traits then you might want to think about exploring something new and joining the growing global tribe of graphic recorders. Our awesome online course Be a Graphic Recorder teaches you all the skills you'll need to start capturing conversations brilliantly. 8 weeks of exercises and support from me, an expert in the field with over 12 years experience running a graphic recording studio. I've drawn everywhere from a muddy field to Buckingham Palace and have worked with clients like TimeWarner, Google and the NHS. 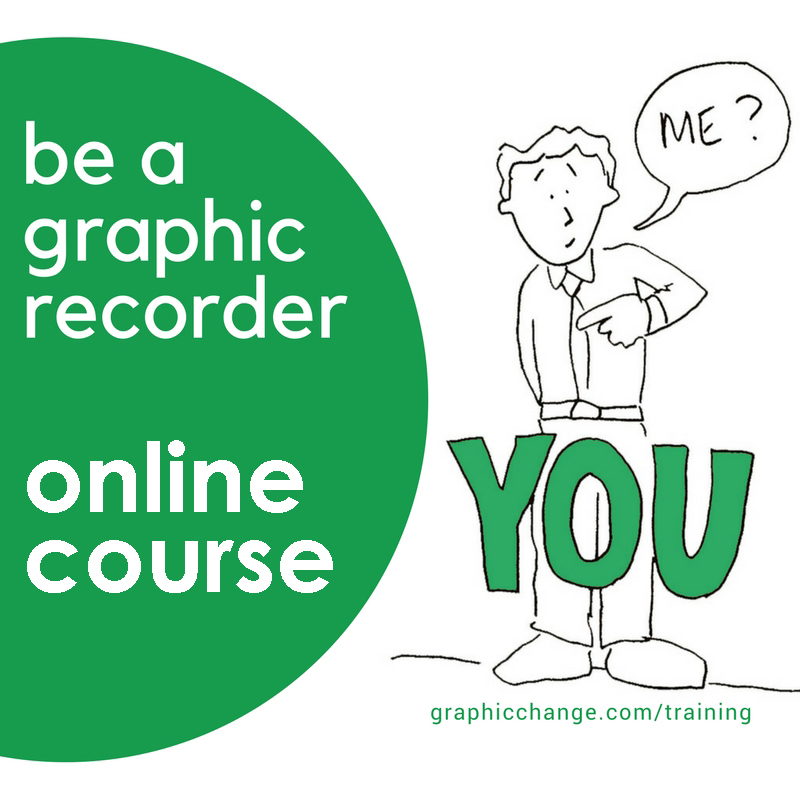 The course is in our online Graphic Change® Academy, with content available 24/7 so you can do the exercises when it suits you, with an private group to share your work and individual tutor feedback on your work, it's a perfect place to start your career as a graphic recorder. We have students in 59 countries (and counting). To join them head to our training pages. Graphic Change is a visual thinking studio that works with individuals and businesses helping them to get the benefits of working visually. 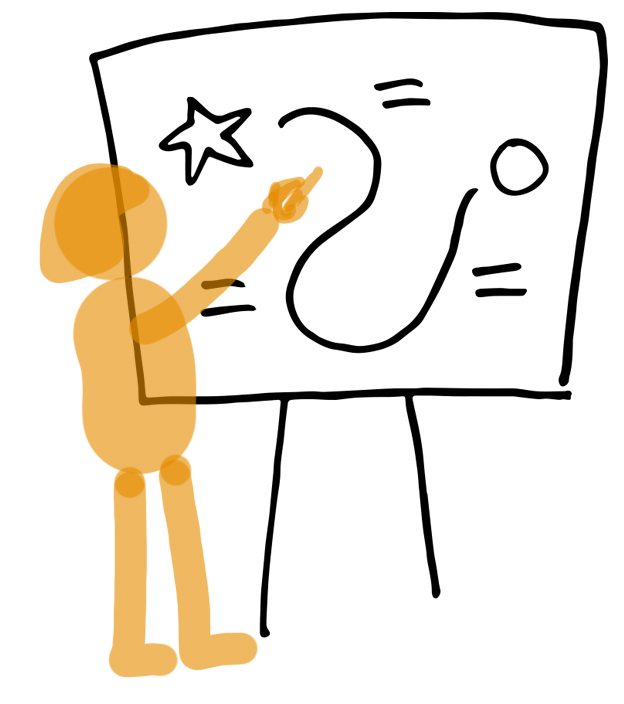 If you want to find out more about working visually in meetings join our online course Be a Visual Facilitator to learn the skills you need, or if you want to chat through at possible project, get in touch. If you enjoyed this read, let us know by clicking 'like' below, and if you know someone who will appreciate this post, share it forward. Imagine you’re going on a journey, leaving from your front door and heading out to a supermarket, one that you haven't been to before. Now imagine you’re making the journey in a world that doesn’t rely on visual communication. No google maps, no satnav, no road signs, no black and white striped crossing, no red and green traffic lights, no shop sign, no big orange sales stickers showing you where the bargains are, no pictures of food on the packets, no logos… you get my point. The world would be much harder to navigate without all of the visual clues we rely on. Visual clues that we usually don’t pay that much conscious attention to at all. It’s not our fault, it can be hard to focus when we’re busy. Our minds are cluttered, our thoughts are turned inwards trying to work through the muddle, sometimes our conscious mind stops engaging entirely and we operate on auto pilot not really aware of our surroundings at all. So it’s understandable that we don’t always pay attention to all of the visual communication we're seeing and using out there in the world. But we do communicate visually all of the time by using colour, shape, scale, pictures and text in different ways. Start building your visual muscle memory, being conscious of your visual brain. How? The best place to start is by paying closer attention to what you see around you every day. This is an extract from Cara's upcoming book Draw a Better Business™. If you enjoyed this little read, let us know by clicking the "like" below. If you want to be the first to hear when Cara's book is out, you can sign up to our watchlist. Or, if you want to learn more about working visually, have a look at our online courses. If you know a visual thinker who will appreciate this post, do share it forward. Last week it was World Book Day, and this year it coincided with a particularly timely email landing in my inbox. The email was from my publisher and it seemed innocent enough. It said something along the lines of, "when will you have the final manuscript to me?". Now those of you who have written a book will back me up here, writing a book can be hard going. It's a big old task, and one that for someone who is a bit of an introvert, can feel a bit like walking onto a stage, naked and vulnerable to the view of an unseen audience. But, I do want the book finished. I want to get some of the thoughts that have been rattling around my head for years, out of my head and into the world. I want to share the lessons I've learned about working visually in business with anyone, and everyone, who might glean a useful nugget they can apply in their own business. I mean that is why I do what I do! I want the world to draw more and get all the benefits of working visually. So as exposing as it all is, I knew I needed to commit...to an actual deadline. "The end of March", I replied. Just over 4 weeks. It feels like a huge step. A colossal commitment, both terrifying and overwhelming, which of course got me thinking...about bravery. Today (5th March) our free online course, Draw More Boot Camp, opens its virtual doors again to welcome a new group of students. I launched the boot camp as a safe first stepping stone for all the people out there who think they "can't draw", and who know that this is holding them back from getting the benefits of being more visual in their work, whatever business they're in. For some people the boot camp takes a great deal of bravery to enter in to, but I ask them to put their trust in me. Trust me to help them start a journey of rediscovering their innate creative, visual selves. In the last few months almost 250 people have been brave and signed up to the boot camp. To me that's a big deal. I've seen the results, and I know that the bravery pays off tenfold as people see just how far that first step takes them. So for the next 4 weeks I'm going to keep all the brave boot campers in mind. I'm going to commit. I'll drag my chair and my laptop up onto that scary stage and get this book finished. Cara works with individuals and businesses helping them to get the benefits of working more visually, and is author of the upcoming book Draw a Better Business. If you want to be the first to hear when Cara's book is out, you can sign up to our waiting list. Or, if you want to know more about our online courses, follow this link. If you enjoyed this read, let us know by clicking the "like" below, and if you know a visual thinker who will appreciate this post, share it forward. I love having a creative business. The fact that I dreamt about it for a really long time while I was working as a manager [read my blog about that here] makes it especially pleasing to know that I'm getting paid to be a creative and draw for a living. I am literally living my dream. So imagine my surprise, when I realised that it wasn't enough. How could it be that I was spending all day being creative, but actually find myself feeling creatively hemmed in? The want of another creative outlet was starting to affect my creative mojo in the business I loved and had dreamed of. How could I know that after years of wishing I had more creative time that I was actually wishing for the wrong thing! Now, you might think that getting 1. would automatically give me 2. I know I did. In fact for the first few years I was so busy doing 1. that I didn't notice that being paid to create content for other people didn't really fulfill my need for 2. ...that's when I realised I needed a side gig. A side gig can be huge or tiny. Regular or random. It doesn't really matter. Just something that is purposeful and gets your creative juices flowing without being curtailed by someone else's agenda. So I jumped in feet first. My first side gig was to set up a whole other business; Patternbooth. I know right? *slow eye roll. Yes, at first it fed my creative need. I designed stuff, I figured out how to make stuff, all the things I love...I even started getting national press, but before long, it started to build up into something that didn't feel that different to my main business. Lots of work and not a lot of unboundaried creative time. Since then I've realised my side gigs don't need to be as big, in fact they don't need to be gigs at all. Now I get my extra creative kicks in a much more modest way. Not regular enough to be a hobby, not income generating enough to be a gig. Let's call it a Gibby. I indulge myself in Gibbies as and when I need them. They satisfy that side of my creativity that likes a brief but doesn't like rules and deadlines, and without getting in the way of the creativity that I need, to actually pay the bills. Cara works with individuals and businesses helping them to get the benefits of working more visually, and is author of the upcoming book Draw a Better Business™. If you want to find out more about working visually in meetings join our online course Be a Visual Facilitator to learn the skills you need. If you want to talk through a project we can help you with get in touch. Hi, I'm Natasha. Although you haven't heard from me on the blog before, I'm the other half of Graphic Change, and I'm a project manager by trade. For many years now, I’ve worked creatively and visually to deliver projects and change in companies. I’ve seen for myself how a workforce can both have more fun at work but also be more engaged, take more responsibility and be more productive by working more creatively together. Before I ran a visual workshop with the Directors of my last workplace, I knew they had mostly been in ‘dry’ meetings, with lots of reading and wordy presentations. That’s what grown-ups do, right? So I prepared them to open their minds to a new way of working, and laid out explicit rules that effectively made me the boss of them…for a brief morning session at least. I created a game of Top Trumps with the list of projects on our wishlist that year and we spent the morning playing the game. We came out with an agreed project portfolio for the year that reflected our 5-year strategy. In 2.5 hours. At the time I ran the strategy workshop with them, our management team did parallel work with a well-known 3rd party consultancy. It took us over 3 (not fun) days with the consultancy (can you imagine the cost of that in people’s time alone?) to come out with a couple of big spreadsheets. So what happened next? The Directors abandoned the 3rd party work and just adopted my creative approach…it was simpler, it spoke to people, it was memorable and it got the job done. Painlessly. We did it annually then. I don’t know if I’ll ever see such a side-by-side comparison of creative vs. traditional ways of working again in my career. But it proved what I already suspected from my experience: working visually engages people, it helps them focus, it promotes creativity in idea-generating and problem-solving, it makes meetings more productive and enjoyable and it makes communications clearer. It really doesn’t matter how senior, logical or serious people are…there is something about working visually, standing up, laying things out, voting for things with stickers, that engages everyone on many levels. I worked in highly regulated European banking and financial services environments. Mostly with IT changes. Never with much of a budget or many people (don’t believe everything you’ve heard about banks…). So believe me when I tell you, if I can prove to a bunch of bankers (literally) that working more visually is not only more fun, but delivers better results, then you can do it in your working environment, too! Super charge your meetings with this guide to visual agendas. Think Do Draw. Here are some simple ways to learn more about working visually. You might have convinced yourself you can't draw, but it's time to ditch the negative thinking and reset to positive. Reasons to be visual #2 - make your communications sticky.